The hummingbird visits are rare now. I put out fresh flowers today and had just one small visitor who spent a brief amount of time investigating the feeder. He was quite shy, and I only managed three or four clicks of the shutter before he was spooked and flew off to an adjacent tree to wait until the noise subsided. I knew it wasn’t the bold young male who’s been protecting the feeder because when he heard the shutter he’d fly over to investigate. Today the goldfinches dominated the yard, with a flock of them hunting insects and eating berries throughout the day. I watched them chase each other through the trees, swooping here and there as they mingled with the resident doves and sparrows. It’s almost time for me to resume filling the seed feeders and concentrate on the fall and winter birds. Although I look forward to the beauty of the cardinals and woodpeckers, I’ll certainly miss the precocious hummingbirds that made spending summer afternoons at my desk so enjoyable. Wonderful shot! Thanks for sharing it with us. You’re welcome! Thank you for taking the time to view it! 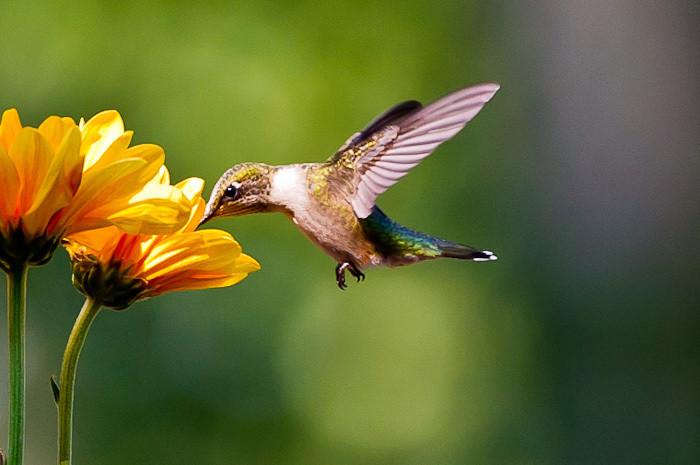 This is the best yet of your hummingbird pics! Thanks for sharing. Thanks Lucinda! They have been fun birds to play with this summer. I look forward to working with them again next year. Ah, to every season. Thanks for sharing the end of summer with us through this great shot. I look to seeing the next seasons from your desk and yard. Thank you, Patti. It’s a little bittersweet to move on to fall. I’ve left the flowers outside the past few days, and the bees have been enjoying them. I’ve put off taking down the feeders just in case, but this weekend I’ll switch over to seed feeders. So sweet and delicate, Tricia! I just love how the wings look. So far, I haven’t been able to freeze the wing motion. Looking forward to your winter bird photos! Glad you liked it, Nia! Wonderful photo!! Thanks for sharing. Thank you, David! I appreciate your kind words!